Published: Oct. 21, 2013 at 12:51 p.m. Updated: Oct. 21, 2013 at 04:30 p.m.
Professional football lost another one of its most influential architects on Monday. Tennessee Titans owner K.S. 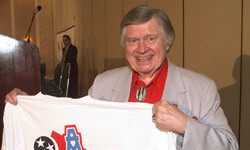 "Bud" Adams Jr. passed away of natural causes at the age of 90 in his Houston home, the team announced Monday. Adams was the longest tenured owner in the NFL. Fifty-four years ago, Bud Adams and Lamar Hunt held a joint press conference to announce the formation of the new American Football League. Adams, the co-founder of the AFL, pursued his passion for football every day until his passing on Monday. Buffalo Bills owner Ralph Wilson now is the last remaining owner/founder of that group, having been with the Bills since their inception in 1960. Adams, a World War II veteran, presided over more wins with his organization (409) than any current NFL owner. Most of those wins came in Houston, where Adams' Houston Oilers won the first two AFL titles in 1960 and 1961 before losing the '62 title to Hunt's Dallas Texans team. Adams' teams made the playoffs 21 times. Adams' Oilers were the first football team to play its home games at an indoor stadium, the Houston Astrodome. The Oilers played there until 1997, when Adams moved the organization to Tennessee, ending a contentious relationship with the city. Former Houston Oilers coach Bum Phillips, who Adams fired in 1980 amid great controversy, also passed away Friday at the age of 90. John McClain of the Houston Chronicle notes that the last game Adams was able to attend was Tennessee's Week 2 overtime loss to the Texans in Houston. "Bud Adams played a pivotal role in the growth of pro football as a pioneer and innovator," NFL Commissioner Roger Goodell said in a statement. "As a founding owner of the American Football League that began play in 1960, Bud saw the potential of pro football and brought the game to new cities and new heights of popularity, first in Houston and then in Nashville. "He was a brilliant entrepreneur with a terrific sense of humor that helped lighten many a tense meeting. His commitment to the best interests of the game and league was unwavering, and his personal along with the team's impact in community relations and philanthropy set a standard for the NFL. Bud was truly a gift to the NFL. We extend our deepest sympathy to his daughters Susan and Amy, and the entire family." Adams and his wife, Nancy, were married for 62 years before her passing in February of 2009. He is survived by two daughters, Susie Smith and Amy Strunk. Adams' only son, Kenneth S. Adams III, is deceased. We send out condolences to the Adams family and the Titans organization at this time.